This is a Confederate Navy Jack flying in No Name City in Wöllersdorf near Vienna on June 16 2006. This is what most people think of when someone mentions the “Confederate Flag.” But the Confederacy had lots of different flags and this is actually the Confederate Navy jack. (A ‘jack’ is a flag flown at sea.) It never flew over government buildings and was never carried into battle by Confederate troops. 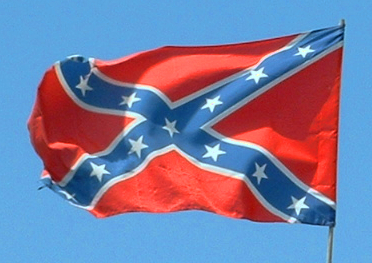 I find it annoying when people, which is almost everyone, get their Confederate flags wrong. It is an irony of maritime history that right-wing racist groups who wave the Confederate flag as a symbol of their odious beliefs, are actually waving the Confederate Navy jack which is rectangular as you can see in the example above. Curiously, I read or hear people refer to this flag as the “Stars and Bars”. This is incorrect.